Little turtle pendant is back!! Turtle has a loop for the necklace strand behind its head. The shell is slightly domed. Very sweet! 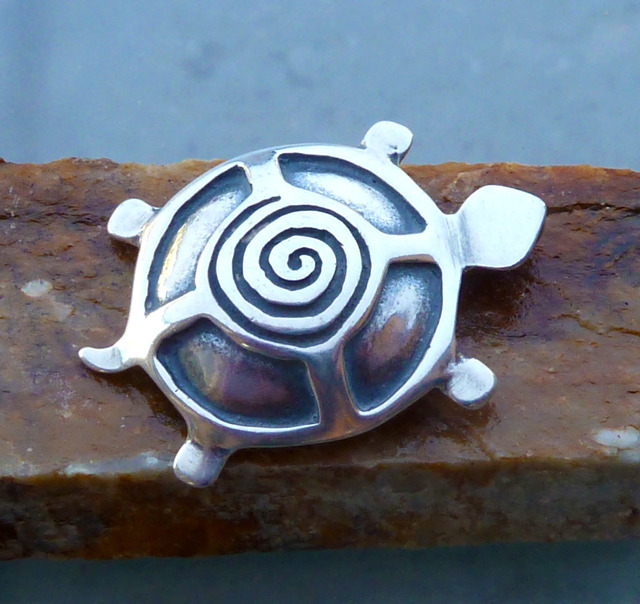 Turtle has meaning in many cultures – it can represent Mother Earth, motherhood and creativity. Turtle lives a long time and is protected by its shell, so it also represents longevity and innocence. Spiral is found everywhere in nature – even our galaxy is a spiral! It is the cosmic force of life, or a representation of nature’s cycles. 7/8 inches across, 1 1/4 inches long. Sterling silver.